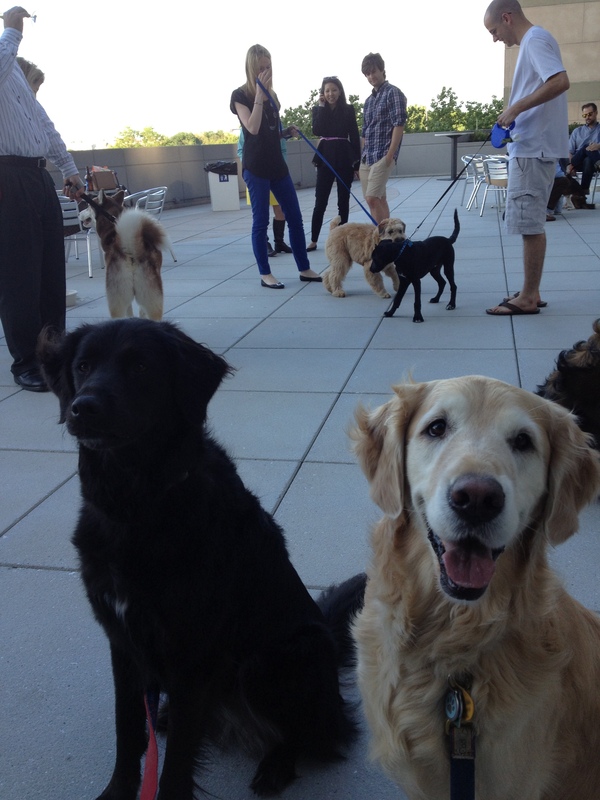 The girls and I checked out the new-this-year Rosslyn Yappy Hour at Le Meridien hotel last night. It was a perfect evening with cool temperatures and clear skies. 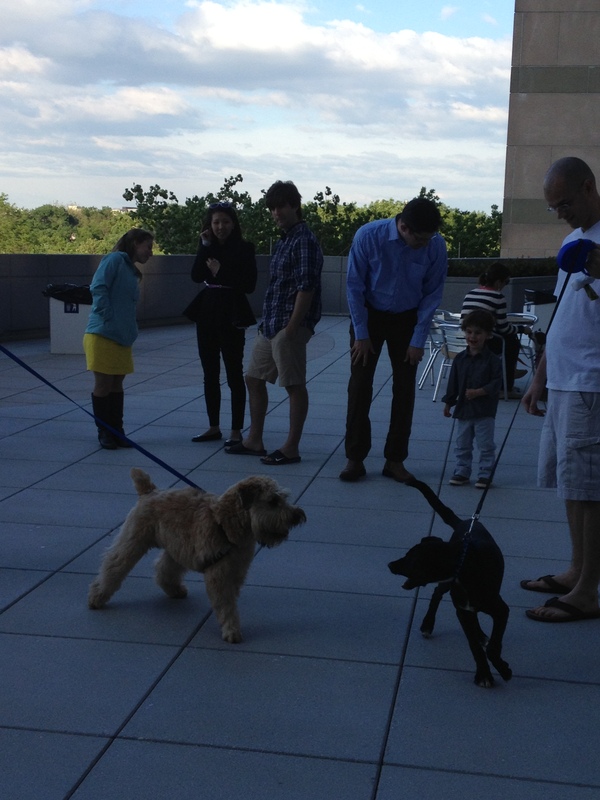 The Yappy Hour is held every Friday from 6 to 8 pm on a large terrace overlooking the Potomac and Georgetown skyline. Dogma Bakery supplies free treats, and the Rosslyn BID (business improvement district) has giveaways including waste bags and bone-shaped dispensers. The event is free to attend. Amuse restaurant serves cocktails and appetizers for pet owners as well as a few treats for our four legged friends. The prices are good, an Amstel Light bottle was only $4.40. Other attendees ordered meatballs and salmon burgers (doggie-sized) for their pups. 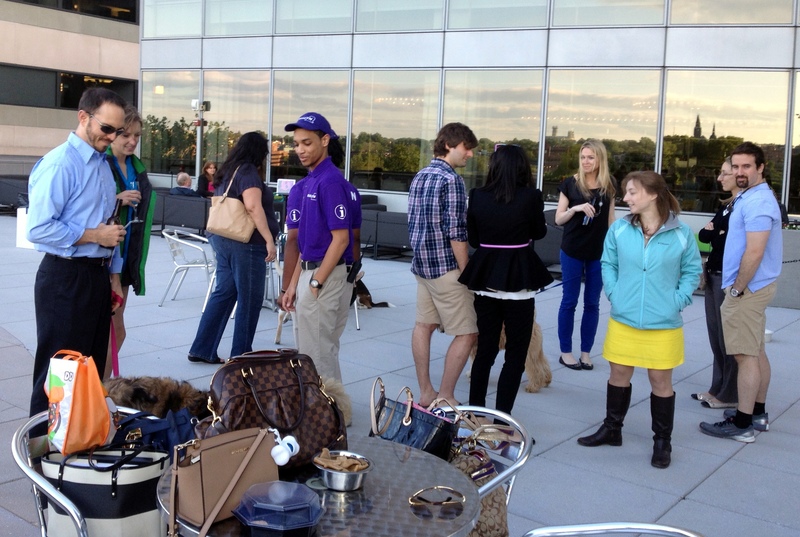 It was a friendly crowd with a lot of mingling by both owners and pups. 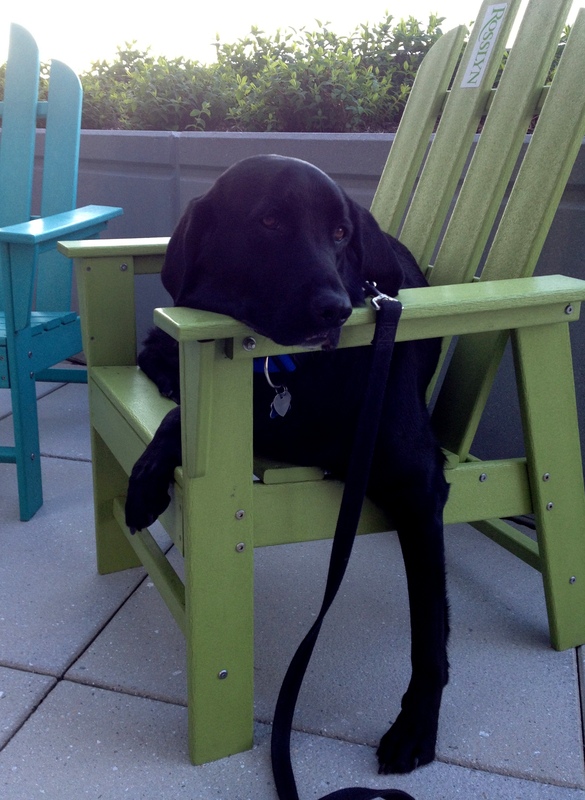 Tug, a lab mix, decided he’d rather strike a (rather awkward) pose and just chill in an Adirondack chair. The views of Georgetown were great. The terrace is on the fourth floor, so you have to take a glass elevator ride up, which was a little concerning for my girls, but they didn’t freak out. 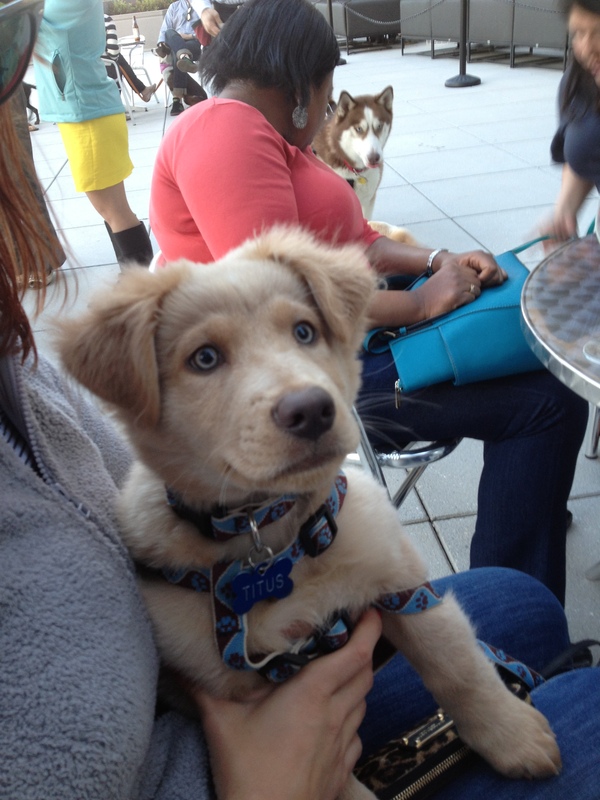 Titus, a Chow-Golden mix puppy, got (deservedly) a ton of attention. I had no problem getting a parking spot on the street around the corner, which was free after 6 pm. All in all, it was a fun event. 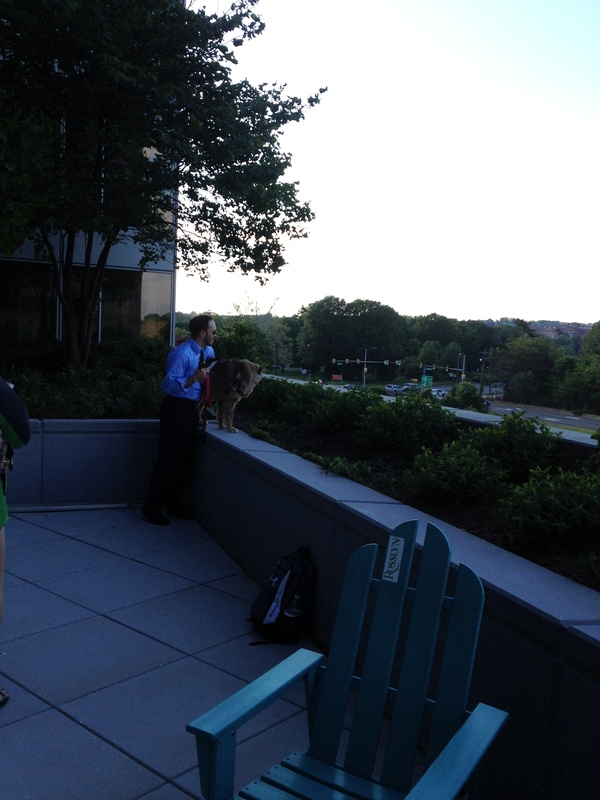 After a work week away from your pup, it’s a great way to wind down and welcome the weekend. Check it out!